If you enjoy pop music, for real or satirically and live in Europe, chances are that you would have certainly come across the Eurovision Song Contest. During this TV show, the viewer is offered all sorts of songs and dances performed by emissaries of each European country. In general, although there are a few exceptions, artists perform a pop song in order to reach a wider and more universal audience than local musical styles would allow. Or is it so really? In this post, I examine through network visualisation a few of the potential drivers of the votes for this contest. Once every contestant has done their show, the audience as well as a panel of professional jury members selected in each country cast their votes for the best performance. Each of these voting entities accounts for half of the final score that is translated in a set of points (1, 2, 3, 4, 5, 6, 7, 8, 10 & 12 points) distributed to the performing countries. As there are more countries to whom points can be awarded than available votes (10) per countries. So, voting in and by itself may be viewed as an indicator of interest of one country for another regardless of the number of points awarded. But what is actually rated? Is it really the performance of the artists or more some sort of cultural or political affinities? The real fun begun when some researchers started to look at the meaning of those scores beyond the simple rating of performance they are supposed to reflect. As a matter of fact some brilliant minds claim to have evidenced odd patterns in the results showing that some nations where “exchanging” votes. For instance some have suggested the existence of “Regional Blocks” voting between countries holding strong political alliances. While others simply suggest that countries “exchange” points because they share the same musical culture and tastes. By using the magic of Gephi an opesource software and the compiled data of 16 years of Eurovision (in gephi format), here is the kind of visualisation you can create to understand what actually drives the votes in this competition. Each country that has participated to the Eurovision in the last 16 years is represented on this wheel. The information displayed by this chart can be broken down in 3 categories. 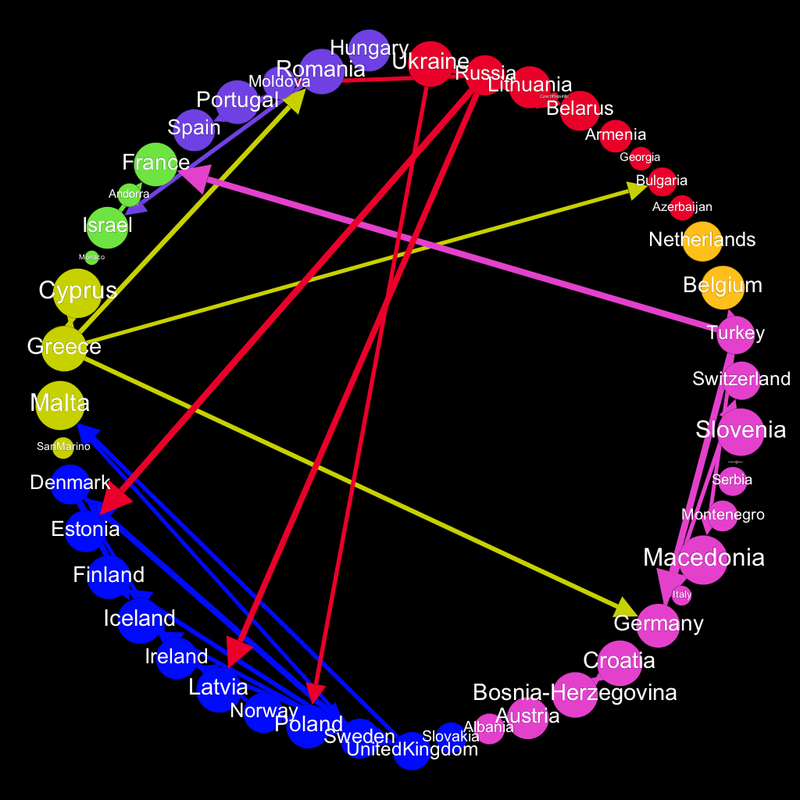 Nodes: Each country is symbolised by a node (coloured circle). The size of the node is proportional to the number of votes (not points) this country has received from other nations. It shows its connectivity or popularity amongst the European countries. Communities: Countries that have constantly voted for each other over the last 16 years, no matter the points they gave to each other, are represented in the same colour. They can be seen as community of voters (Louvain Modularity method, sensitivity set to .8). The countries are arranged clockwise in their colour group as a function of their centrality in the community. So the more central a country is in its community, the more votes this country has received from other members of the same community. For instance, Belgium and the Netherlands regularly vote for one another, though the Netherlands has overall received much more votes from Belgium than Belgium has from the Netherlands. Edges: Finally, the vectors and arrow, or edges represents votes that a country has casted for an other country. The arrows show the direction of the vote from the point giver to the receiver. However, in this case not every single vote is represented. As a matter of fact, 16 years of voting represents exactly 12892 votes or edges, number which would not be very helpful to represent. So in this graph, I only kept the edges that represent a statistically deviant voting pattern. Over 16 years each country has given a certain cumulated amount to an other. his amount is the weight of the edge that links a country to another. For instance, if Sweden has voted 3 times for Norway giving it 8, 10 and 12 points, the weight of the edge is 30. On average each nation award 17,9 points to each other. The vectors represented in this graph are those which weight is 3 standard deviation over the overall average and could be considered as statistical oddities. This figure highlights several things. First, it seems to support the “Regional Blocks” hypothesis as it renders the existence of “gangs” of countries constantly voting for one another, independently of the amount of point they give. This is for instance the case of the “former Soviet union gang” (in red with: Ukraine, Russia, Lithuania, Czech Republic, Belarus, Armenia, Georgia, Azerbaijan), the partial “Benelux gang” (Belgium and the Netherlands), the “Baltic gang” (Denmark, Estonia, Finland, Iceland, Latvia, Norway, Poland, Sweden) and the “Ionian gang” (Malta, Cyprus and Greece). Though, the type of grouping shown here is not incompatible with the geo-cultural hypothesis of vote exchange in the Eurovision contest. Viewers from countries that have cultural affinities may indeed be more sensitive to some types of musical styles. It is interesting to note however that some grouping seems less obvious like France and Israel. When the wheel is “spatialised” in google maps, it gives a better view of this potential geo-cultural influence. Second, it also show an other kind of tendency, particularly through the edges represented on the map. Again, for the sake of clarity, those edges or vectors show a statistically abnormal tendency of one nation to distribute a higher score (e.g., 12 points) to another nation. This behaviour can be observed on two different level. Either one country gives higher marks to another country that is part of the same colour group or to a country outside of its community. The geo-cultural hypothesis still holds when this voting behaviour is observed within one group. For instance, one can easily understand why Greece gives more systematically higher points to Cyprus. It should be noted though, that this voting behaviour is not always observed between countries with a strong cultural overlap such as Belgium and the Netherlands or Germany and Austria, for instance. It should also be noted that this behaviour can be present when the cultural overlap is less obvious such as Israel favouring France. However, the outlier votes seems to be motivated by other factors when they occur between communities. One interesting trend, for instance, is how Turkey frequently give more point to Germany, Belgium and France. How could it be that country remote from one another and that share some, but limited cultural influences show this type of link? The same question applies for Sweden giving higher points to Malta, though no cultural legacy of one over the other can be found in history. For those edges, it could be that preference transcend boundaries and geo-cultural regions and follows the flux of migrants. As a matter of fact, France, Germany and Belgium are known to host a considerable Turkish community. The same applies to Malta which host an increasing number of Swedes. Above and beyond intrinsic quality, could it be that sympathy for the performing country plays a determinant role in the votes? Or is it that the community of migrant influenced their host music style to the point that it makes it more compatible with the taste of their peers at home? Interestingly, this is the kind of question that network data visualisation can help to answer. Third, another finding illustrated by this representation is that some nations are much more consistent in their ranking than others, meaning that over 16 years, they tend to award the highest scores not to one but three or more countries. This is for instance the case for Sweden that constantly favours Denmark, Iceland and Finland (but not Norway) or Russia which gives more frequently higher points to Estonia, Latvia, Lithuania, Belarus and Moldova. While this could be taken as an other sing of geo-cultural voting, this tendency seems to be restrained to only an handful of countries. Interestingly, even nations that share strong cultural overlapping with more than one country, like Switzerland for instance, spread more equally their votes to other countries and not to prefer anyone in particular. What’s so pop about pop? As shown in this post, network analysis and visualisation can be quite compelling in the exploration of relationships in the data and crucially highlights what would have been easily missed otherwise. The analysis presented in this blog only describe a fraction of that information that is represented in those graphs. Feel free to use the provided fils and tell us what you’ve found in the comment section. To conclude, Andy Warhol may have been right by saying “Pop is for everyone”, but as far as competition goes, alliances and culture prevails. Notre vision serait-elle façonnée par la morale ?